Rajasthan ( [raːdʒəsˈt̪ʰaːn]; literally, "Land of Kings") is India's largest state by area (342,239 square kilometres (132,139 sq mi) or 10.4% of India's total area). It is located on the north western side of the India, where it comprises most of the wide and inhospitable Thar Desert (also known as the "Rajasthan Desert" and "Great Indian Desert") and shares a border with the Pakistani provinces of Punjab to the northwest and Sindh to the west, along the Sutlej-Indus river valley. 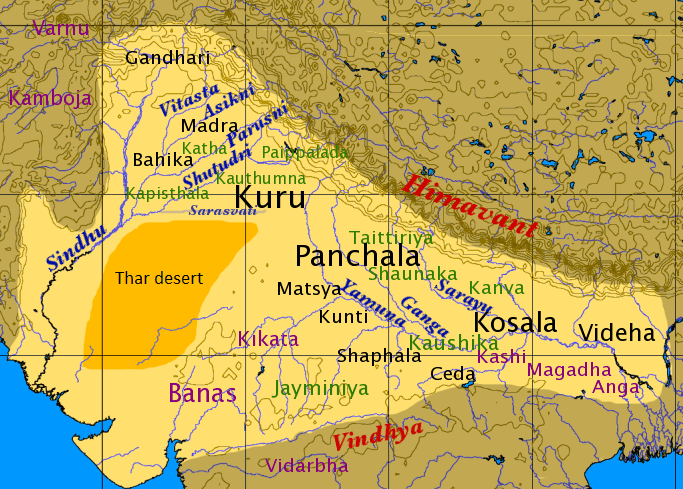 Elsewhere it is bordered by five other Indian states: Punjab to the north; Haryana and Uttar Pradesh to the northeast; Madhya Pradesh to the southeast; and Gujarat to the southwest. The state was formed on 30 March 1949 when Rajputana – the name adopted by the British Raj for its dependencies in the region – was merged into the Dominion of India. Its capital and largest city is Jaipur. Other important cities are Jodhpur, Udaipur, Bikaner, Kota and Ajmer. Traditionally the Rajputs, Jats, Meenas, REBARI, Gurjars, Bhils, Rajpurohit, Charans, Yadavs, Bishnois, Sermals, PhulMali (Saini) and other tribes made a great contribution in building the state of Rajasthan. All these tribes suffered great difficulties in protecting their culture and the land. Millions of them were killed trying to protect their land. A number of Gurjars had been exterminated in Bhinmal and Ajmer areas fighting with the invaders. Bhils once ruled Kota. Meenas were rulers of Bundi, Hadoti and the Dhundhar region. The powerful Meenas ruled over Dhundhar region,Hadoti and many other places in Rajasthan until 12th 20th century. Rajasthan's formerly independent kingdoms created a rich architectural and cultural heritage, seen even today in their numerous forts and palaces (Mahals and Havelis), which are enriched by features of Islamic and Jain architecture. The northwestern portion of Rajasthan is generally sandy and dry. Most of this region are covered by the Thar Desert which extends into adjoining portions of Pakistan. The Aravalli Range does not intercept the moisture-giving southwest monsoon winds off the Arabian Sea, as it lies in a direction parallel to that of the coming monsoon winds, leaving the northwestern region in a rain shadow. The Thar Desert is thinly populated; the town of Jodhpur is the largest city in the desert and known as the gateway of thar desert. The desert has some major districts like Jodhpur, Jaisalmer, Barmer, Bikaner and Nagour. This area is also important defence point of view. Jodhpur airbase is Indias largest airbase and military, BSF bases are also situated here. A single civil airport is also situated in Jodhpur. The Northwestern thorn scrub forests lie in a band around the Thar Desert, between the desert and the Aravallis. This region receives less than 400 mm of rain in an average year. Temperatures can sometimes exceed 54 °C in the summer months or 129 degrees Fahrenheit and drop below freezing in the winter. The Godwar, Marwar, and Shekhawati regions lie in the thorn scrub forest zone, along with the city of Jodhpur. The Luni River and its tributaries are the major river system of Godwar and Marwar regions, draining the western slopes of the Aravallis and emptying southwest into the great Rann of Kutch wetland in neighbouring Gujarat. This river is saline in the lower reaches and remains potable only up to Balotara in Barmer district. 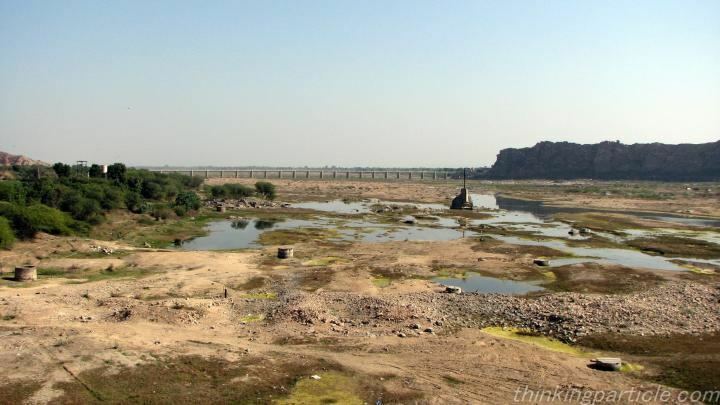 The Ghaggar River, which originates in Haryana, is an intermittent stream that disappears into the sands of the Thar Desert in the northern corner of the state and is seen as a remnant of the primitive Sarasvati river. 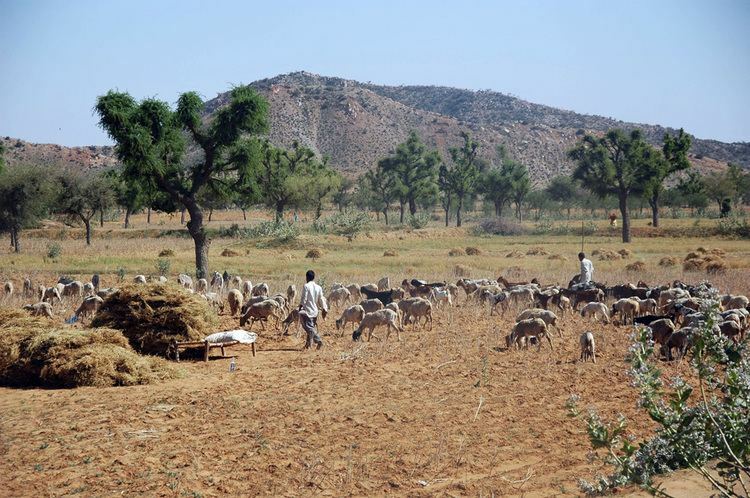 The Aravalli Range and the lands to the east and southeast of the range are generally more fertile and better watered. This region is home to the Kathiarbar-Gir dry deciduous forests ecoregion, with tropical dry broadleaf forests that include teak, Acacia, and other trees. The hilly Vagad region, home to the cities of Dungarpur and Banswara lies in southernmost Rajasthan, on the border with Gujarat and Madhya Pradesh. With the exception of Mount Abu, Vagad is the wettest region in Rajasthan, and the most heavily forested. North of Vagad lies the Mewar region, home to the cities of Udaipur and Chittaurgarh. The Hadoti region lies to the southeast, on the border with Madhya Pradesh. North of Hadoti and Mewar lies the Dhundhar region, home to the state capital of Jaipur. Mewat, the easternmost region of Rajasthan, borders Haryana and Uttar Pradesh. Eastern and southeastern Rajasthan is drained by the Banas and Chambal rivers, tributaries of the Ganges. Major ISP and Telecom companies are present in Rajasthan including Airtel, Data Infosys Limited, Reliance Limited, RAILTEL, Software Technology Parks of India (STPI), Tata Telecom, Vodafone. Data Infosys was the first Internet Service Provider(ISP) to bring internet in Rajasthan in April 1999 and OASIS was first private mobile telephone company, which was later taken over by Airtel. Rajasthan is the largest producer of barley, mustard, pearl millet, coriander, fenugreek and guar in India.Ramganj Mandi in Kota district is the Asia's largest mandi or market of coriander. Rajasthan produces over 72% of guar of the world and 60% of India's barley. Rajasthan is major producer of aloe vera, amla, oranges leading producer of maize, groundnut. Rajasthan is 2nd in production of cumin, gram and 3rd in seed spices. Rajasthan government had initiated olive cultivation with technical support from Israel.The current production of olives in the state is around 100-110 tonnes annually. Rajasthan is India's second largest producer of milk. Rajasthan has 13800 dairy co-operative societies. There are three main airports at Rajasthan- Jaipur International Airport, Jodhpur Airport, Udaipur Airport and recently started Bikaner Airport. These airports connect Rajasthan with the major cities of India such as Delhi and Mumbai. There are two other airports in Jaisalmer, Kota but are not open for commercial/civilian flights yet. One more airport at Kishangarh, Ajmer .i.e. Kishangarh Airport is being constructed by the Airport Authority of India. Rajasthan is connected with the main cities of India by rail. Jaipur, Jodhpur, Kota, Bharatpur, Bikaner, Ajmer, Alwar, Abu Road and Udaipur are the principal railway stations in Rajasthan. Kota City is the only Electrified Section served by three Rajdhani Expresses and trains to all major cities of India. There is also an international railway, the Thar Express from Jodhpur (India) to Karachi (Pakistan). However, this is not open to foreign nationals. According to final results of 2011 Census of India, Rajasthan has a total population of 68,548,437. Rajasthan's population is made up mainly of Hindus, who account for 88.49% of the population. Muslims make up 9.07%, Sikhs 1.27% and Jains 0.91% of the population. The state of Rajasthan is also populated by Sindhis, who came to Rajasthan from Sindh province (now in Pakistan) during the India-Pakistan separation in 1947. Hindi is the official and the most widely spoken language in the state (91% of the population as per the 2001 census), followed by Bhili (5%), Punjabi (2%), and Urdu (2%). Rajasthani cooking was influenced by both the war-like lifestyles of its inhabitants and the availability of ingredients in this arid region. Food that could last for several days and could be eaten without heating was preferred. The scarcity of water and fresh green vegetables have all had their effect on the cooking. It is known for its snacks like Bikaneri Bhujia. Other famous dishes include bajre ki roti (millet bread) and lashun ki chutney (hot garlic paste), mawa kachori Mirchi Bada, Pyaaj Kachori and ghevar from Jodhpur, Alwar ka Mawa(Milk Cake), malpauas from Pushkar and rassgollas from Bikaner. Originating from the Marwar region of the state is the concept Marwari Bhojnalaya, or vegetarian restaurants, today found in many parts of India, which offer vegetarian food of the Marwari people. The phenomenon of spirit possession has been documented in modern Rajasthan. Some of the spirits that are claimed to possess Rajasthanis are seen as good and beneficial while others are seen as malevolent. The good spirits include murdered royalty, the underworld god Bhaironji, and Muslim saints. Bad spirits include perpetual debtors who die in debt, stillborn infants, deceased widows, and foreign tourists. The possessed individual is referred to as a ghorala ("mount"). Possession, even if it is by a benign spirit, is regarded as undesirable, as it entails loss of self-control and violent emotional outbursts. In Rajasthan, Jodhpur and Kota are major education hubs. Kota is known for its quality education in preparation for competitive exams, coaching for medical and engineering exams, while Jodhpur is home to many higher education institutions like IIT,NIT, AIIMS, National Law University, Sardar Patel Police University, National Institute of Fashion Technology, MBM Engineering College etc. Kota is popularly referred to as, "coaching capital of India". Other major education institutions are Birla Institute of Technology and Science Pilani, Indian Institute of Technology Jodhpur, Malaviya National Institute of Technology, Jaipur, IIM Udaipur, AIIMS Jodhpur and LNMIIT. Rajasthan has nine universities and more than 250 colleges. There are 41 engineering colleges with an annual enrolment of about 11,500 students. Apart from above there are 41 private universities like Singhania University, Pacheri Bari Amity University Rajasthan (Jaipur), Mewar University Chittorgarh, OPJS University, Churu, Mody University of Technology and Science Lakshmangarh (Women's University, Sikar), RNB Global University, Bikaner. The state has 23 polytechnic colleges and 152 Industrial Training Institutes (ITIs) that impart vocational training. In 2009, Central University of Rajasthan a central university fully funded by Government of India, came into force near Kishangarh in Ajmer district. Rajasthan is famous for its forts, carved temples, and decorated havelis, which were built by Rajput kings in pre-Muslim era Rajasthan. Rajasthan's Jaipur Jantar Mantar, Mehrangarh Fort and Stepwell of Jodhpur, Dilwara Temples, Chittorgarh Fort, Lake Palace, miniature paintings in Bundi, and numerous city palaces and haveli's are part of the architectural heritage of India. Jaipur, the Pink City, is noted for the ancient houses made of a type of sandstone dominated by a pink hue. In Jodhpur, maximum houses are painted blue. At Ajmer, there is white marble Bara-dari on the Anasagar lake. Jain Temples dot Rajasthan from north to south and east to west. Dilwara Temples of Mount Abu, Ranakpur Temple dedicated to Lord Adinath in Pali District, Jain temples in the fort complexes of Chittor, Jaisalmer and Kumbhalgarh, Lodurva Jain temples, Mirpur Jain Temple of Sirohi, Sarun Mata Temple kotputli, Bhandasar and Karni Mata Temple of Bikaner and Mandore of Jodhpur are some of the best examples.